4-fold KNX pushbutton (max. 8 independent functions). Mounting on round or square wall box. Power supply via bus. 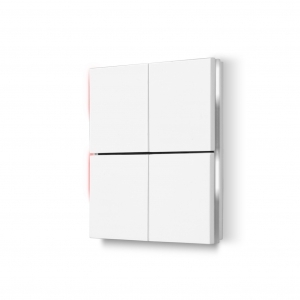 To be used in KNX installations for home and building automation. Bus terminal block, construction-site protection, fixing screws and mounting support included in the delivery. The device has to be to completed with four square or rectangular rockers (to be ordered separately).